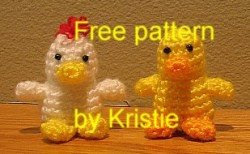 Free Amigurumi Patterns: Hello, Chicky! A couple of cute chick patterns, here. You can choose from a chicken and a duck. I've made these little guys. Easy, but I had to do some trial and error on the beaks, wings and feet to get them to look right. Just couldn't tell for sure on the pictures. But my boys loved em any way!